Ergun Caner apparently spoke at the November 2007 NW Baptist Convention (Number 1, Number 2) and at the 2009 NW Baptist Student Convention (Number 1, Number 2) (link to the Northwest Baptist Convention homepage). All times in the following are approximate. If history is any guide, it may be beneficial to download the audio soon, before someone asks that it be removed. 4:00 "My full name is Ergun Mehmet Caner"
6:15 "I came to faith in Jesus Christ in 1982"
I hope he did, but that date doesn't match his testimony on other occasions. 10:05 "We have two beautiful half breed children - they ignore me in two languages. ... I speak to them in Turkish, Jill speaks to them in redneck ..."
As far as we can tell, Caner doesn't speak Turkish. 10:25 "With my name Ergun Mehmet Caner, Jill does not call me Ergun Mehmet Caner, she calls me Butch." "Butch" was apparently his nickname going back at least to college, but "Ergun Mehmet Caner" was apparently his pseudonym following 9/11. 10:40 "I learned the language, coming to this country. And I learned that in the South, each region of the South has a different flavor of their dialect." I guess that's technically true, given that he came as a toddler. I doubt he learned about dialects as a toddler, though. 11:20 "Her father is from Possum Kill, NC"
It would be great to see some evidence that this place really exists. 19:45 "I leave here after tonight's service, Dr. Cruz, I have to - apologetically I have to miss, but I'll steal your sermon later, cause I steal everything I've got - I was all into the Warren Wiersbe "Be Stolen" series back when they were coming out. I drive from here back down to Seattle, because I'm an idiot. I get on an 11:00 flight, I fly to Washington, DC, then to Roanoke, I pick up my son. The 9 year old Braxton and I then go to Kenya. We got on a 4 pm flight tomorrow. 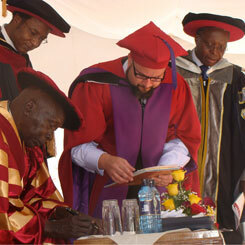 And I speak at Kabarak University and debate the Maathai tribe there - the Muslims there." Ergun did go to Kabarak University (as documented here) to sign an academic deal with that university on behalf of Liberty University (see the image and further discussion below). I'm not sure what tribe Caner had in mind. Presumably, Caner meant the Maasai people (link), but as far as I can tell, those people are not Muslims. Is there any actual debate that took place? I cannot find any evidence to corroborate that story. 21:00 "For some reason, the little world that I travel in, debate, is big now. And so when we debate, it builds the crowds, and people come and we have a chance to present the gospel." I can't see how he lives in the world of debate, seeing as he does not seem to have any significant amount of actual debating experience. 22:15 "I'm happy if in a year, Emir and I will see together maybe 5, 6, 7 Muslims come to Christ. When they come forward, they come forward to yell at us. Arcade Baptist Church in Sacramento, California, a thousand Muslims showed up. At the invitation, the pastor at the time, Daniel Henderson gave the invitation, and they came down both aisles, with Korans in their hand, yelling. Now how do you report that to the director of missions? There's not a block anywhere in that form. They come forward to yell - they throw things - they scream." I would love to see some documentation of this supposed event. Is there any audio or video from that day? Also, I hope that Muslims do come to Christ through the work of anyone at all, including Ergun and Emir. That said, when would this happen? I've found dozens of recordings of them speaking to Christians - where did they speak to Muslims? 40:15 "I had to become like them. I tried. I got FFA magazines - I did. If you don't know what that is, Future Farmers of America, I got 4H, I got 4H, I got all those magazines and I'd write down the words they said on post-it notes, and I'd tape them, put them up on my mirror and then as I shaved, I would practice the words they use. And I would try to use the real phrases so that they could understand me. One Sunday, I was trying to illustrate noetic sin, that man is not a sinner because he sins, he sins because he's sinner, that it's part of who you are, it's your DNA. And I said, 'It's as natural for a man to sin as it is for a bull to chase after a --' and I forgot -- I know, I know, cow, cow, I know, I know but I said, 'as it is for a bull to chase after a she-bull.' God's truth! I couldn't even give the invitation, I had to walk out. It's the truth!" I have trouble believing that Caner couldn't remember the word "cow." 4:40 "You know, eight months after I got saved, I went to college. I didn't know much, I didn't know anything. I went to Bible college, because I wanted to catch up." That would imply he was saved in his senior year of high school. That does not match with some of his other testimonies. 21:45 "My father had many wives, but from our mother, three boys." His father, as far as we know, only had Caner's mother and one woman afterward as wives. 26:30 "My mom was divorced when my brothers became Christians. My father left her, blaming her for our conversion." Ergun Caner's parents first filed for divorce when he was only 8 years old (see evidence here). His father may have blamed his mother for their conversion, but that could hardly be the reason for the divorce, unless they were converted far younger than any of their testimonies have said. 32:05 "I spend the vast majority of my life, on purpose, among heathens who hate me. I go to community colleges, and universities, and state schools - that's why I'm going to Narobi, to Kabarak, because they throw things, and they yell things, because they've never seen Christians half the time." Actually, why he went to Kenya was for the reason you can see in the embedded image. It was to sign a deal between that university and Liberty University (as discussed on Liberty's site here). And Liberty describes Kabarak University this way: "The country’s second president, Daniel T. Moi, founded the school in 2000 to provide Kenyan students with an academically excellent and biblically sound college education." That's hardly "heathens," at least as described by Liberty. 35:00 "You go to Youtube and type in Caner and taser and you'll see that I got tasered live on stage in front of 5,000 kids. Why? I can't remember, it hurt that bad." You can see this event from one angle and it looks pretty convincing (one link). If you look at this event from another angle (second link), notice the taser operator picking up one of the leads from off the floor. Then in this third angle, you can see the second lead bouncing harmlessly off his shirt (third link). A lot of people recorded this, so you get yet a fourth angle here (link). Still, those second and third angles make it clear that he did not get both barbs. 39:20 "I was 18 years old and hated you. You know what reached for the gospel as a Muslim given to jihadeen? A Muslim who hated the Jew and the Christian? A kid whose father was muezzin in the mosque - not the imam but the muezzin and an ulima?" "An ulima" is not grammatically correct. It should be "an alim," as "ulima" is a plural noun meaning "scholars." I question whether Caner's dad was a muezzin in any greater sense that he volunteered to do the call to prayer a few times. If Caner was 18 when he still hated Christians, that would put his conversion at the earliest in November of 1984, which is after he graduated from high school. That does not fit well with his own claim about when he was converted. 40:00 "Jerry Tackett hunted me down for three years. I got kicked out of my home, I lost my family, everything. I lived in people's garages and basements. A year later that same boy in the same little tiny church reached both my brothers. All three boys, raised as jihadeen, born again." Apparently, Caner's non-custodial dad disowned him. However, there is nothing to support the idea that his hippy universalist mother or Swedish Lutheran grandmother did. So, I really question this "kicked out of my house" idea and the "lived in people's garages and basements" idea. Likewise, Caner seems to be suggesting that he and his brothers were raised as Jihadis. There is no corroboration of this story. 2:20 "I was bit nervous because, let me explain it this way, and you're probably going to think less of me, but that's the nature of the beast isn't it. When I lived in Istanbul, the only American television that I saw, became the window that I had into your world. The only thing I knew about America, I learned through television. Until I was getting ready to go into high school, that's all I knew was whatever I saw on TV. And so I thought that was America." Caner came to America when he was about two years old, not when he was getting ready to go to high school. There is no evidence that Caner ever "lived in" Istanbul, though possibly he visited it. 3:10 "Everything I knew about you, I knew through television. And so I watched Andy Griffith." He goes on to compare Mayberrry to Brooklyn. But I doubt a toddler would have noticed the difference. 3:30 "I watched the Dukes of Hazzard. I wanted to marry Daisy." The Dukes of Hazzard didn't even begin to air until the late 70's, after Caner and his parents had been living in America for a decade or so. 3:50 "Every other week, for two hours, on Mehmet television, in Istanbul, Georgia Championship Wrestlin' - WWE and all that, was America to me." As far as I can tell, this is a fictional television station. Also, apparently Georgian Championship Wrestlin' went onto national cable in 1979 (see the discussion here). It's hard to believe it was going international before it went national. 4:45 "So I moved to America and the first two things we did, we went to a Cubs-Mets game ... and then we went to Madison Square Garden to watch wrestling." 7:10 "You need to understand, my children ignore me in two languages. I speak Turkish and they speak Turkish sometimes, but with a southern accent." 28:00 "So when I talk to those people, and I say, 'Let me tell you what my parents went through. See, my father left my mom, because he blamed her that we got saved.'" As noted above, that story does not fit the documented timeline. 0:00 "You don't have to sign anything, you just download whatever debates. I have a two hour debate with the homosexuals, Jehovah's Witnesses, the Mormons, every type of Muslim and Buddhist you can imagine, a Baha'i, I'm going to debate a Baha'i on Monday again. It will be my second one of this four week break. It's just something I want you to have, and I only give it to you because (a) I don't get to spend that much time with you and (b) it's coming here." I've previously analyzed these so-called debates (see the discussion here). Calling these interviews "debates," is very hard to justify, as there is hardly any interaction that I could hear. They may be useful for students, in terms of hearing how various "world religions" describe themselves to Christians, but they can hardly be considered "debates." 0:30 "Every eight years there's a meeting of the caliphat, when the caliphat meets. The caliphat basically religious rulers in the Islamic world - all Sunni. What they do is they target certain states in the United States. They just finished with Hawaii they built three mosques in Hawaii. They just finished Washington, DC - the largest mosque that they built was in Washington, DC. Seattle's next - Seattle, WA, actually the state of Washington itself is next. And what they do is pump money in to that state." The caliphate is the rule by the caliph, like a monarchy is a rule by a monarch. There has been no caliphate since Turkish military leader Mustafa Kemal Atatürk abolished it on March 3, 1924 (see information here). I have no idea what shadowy group, real or imagined, Caner has in mind. There is a large mosque in DC, but it opened in 1957 (see information here). The faqih generally oversees the operation of the government to ensure that its policies and actions conform to Islamic principles. The faqih is a spiritual leader whose religious authority is above that of the president and any other officials. However, in keeping with the practice established by Khomeini, the faqih is expected to refrain from involvement in the day-to-day affairs of governance. An 83-member Assembly of Experts, popularly elected every eight years, is responsible for choosing the faqih (or a council of three to five faqihs, if there is no consensus on a single faqih) from among the most politically and religiously qualified Shia clergy. (source) - but I see no way to get from that to anything that Caner is saying. 6:10 "When I came to America, it was my job to get married. I'm the oldest of three sons to my father,he had other wives, three sons to our mom. As the oldest, it was my job to be the first one to get married. I was the teenager. I had been sworn in marriage at age 8, in Istanbul, but because we moved, I didn't have to be married to that girl who had a better mustache than I did. Turkish women: my people, every Friday night, all the women Nair on their upper lip, all the men, shaving to separate the eyebrow. We all have hairy backs. Is that graphic enough for you? Well I didn't want to marry a Turk - I didn't want to marry a female version of this." Caner had already been living in America for about 6 years by age 8. The idea that he came to America as a "teenager" i.e. in late 1979 or later (he was born in November of 1966), doesn't match the facts we know. Finally, this description of Turkish women is untrue and - of course - offensive. 9:00 "I want to do something with you that I can't do in most places, especially if I'm being taped, because it's sort of giving away our cards. But if I go into a community college or I go into a state university, I have two rules for every debate - I will come anywhere - I don't care where it is, I will come, as long as there is somebody who is sponsoring me, and I don't care - I will debate anyone any world religion as long as I know who they are before I walk in. There are two rules by which I operate: Rule number 1, nobody gets paid. What's the first thing they always say about Christians? 'It's always about the money, isn't it.' ... Rule number 2, a little harder - no Christians are allowed to ask me questions. When I go into a debate, I go in knowing that it's going to be hostile. I go in knowing that the questions that going to come to me are from unbelievers. I believe Christianity is only effective if it is applied in a lost world. And thus, I don't even allow Christians to ask me questions in the debates. Cause a lot of you come because you are of that first group - you don't like fights - and you start feeling sorry for me. And you're not supposed to feel sorry for me. You know, you hear them calling me names and yelling and cussing and you're like 'it's horrible, let's send him an e-card!' or even worse, you will stand up and ask a question." Where are any of these debates? And how is that somehow giving away a debating secret or otherwise showing our cards? 18:10 "Inevitably in the debate, somebody will raise their hand and ask what I refer to as the Oprah question. The Oprah question goes like this: 'Umm, are you saying that a good Buddhist is going to hell?' 'Yes.' Don't ever stutter, don't ever hesitate." What debate, dialog or interview of Caner has ever included a question like that? 21:10 "I would do my prayer time. Do you know what we're doing, aside from putting our foreheads to the ground and sitting up. Do you know what we're doing? We are repeating the first chapter of the Koran over and over. That's all we do. Six verses." It's actually seven verses, not six verses, in the usual enumeration. Useful to have all this info written out. A lot of work, but necessary. Caner once spoke at a atheist club meeting at Central Virginia Community College across the street from Liberty U. It was December 2007. Here is a reference to it on their website. yes, that's the closest thing to a debate that we've "seen." As someone pointed out: " The title of his "discussion" is: "If there is one question you could ask God, what would it be?"" Good luck finding a recording of that event, though. If you find one, please let me know. I don't think any honest person can review the evidence and come to a different conclusion. I took a look. That is a rather extensive list of what appear to be some conflicts. Sure am glad The Lord hasn't lead folks to check the dates, cities, and such that I have quoted (and sometimes Mis-quoted). I can say this for sure, I knew him as But h in college, but also knew that he had several names, Ergun, Michael, Mehmet that I knew. While most of the details seem trivial, I can see where someone who becomes Self-Righteously Legalistic can begin making claims. And those that take it to a witch hunt mentality can lead to telling his son how sorry his dad is, and now we have the tragedy of last week. I have never said that Butch was the best on details, so I guess that has given you guys an open season on him. God will be the final judge on all of this. Of that I am sure. We all make mistakes and mix up details. If that's all this was, then "witch hunt mentality" would be an accurate description. In fact, when I first heard about this - that's how I viewed it too. I initially tried to defend Ergun from a Muslim who was criticizing him for what seemed like pretty trivial things - like pronunciation errors. Normal people, however, don't pretend they came to America when they were teenagers, when the actually came as toddlers. Normal people don't pretend to have been born in countries they weren't born in or have to have been educated in countries they weren't educated in. Normal people don't claim that they and their family went around dressed like fundamentalist Muslims when they didn't. Normal people don't go around claiming they've done dozens of debates when they have not done any. Normal people don't claim to speak Arabic when they can't. As for the judgment of God, I hope Ergun is spared from that judgment by God's mercy. Liars "have their part in the lake which burneth with fire and brimstone: which is the second death." (Revelation 21:8). I still hope for Ergun's repentance and conversion. If you are Ergun's friend - if he will listen to you - I hope you will urge him to repent and turn from his sin back to Christ.